I already gave you the ten best things about Vancouver, but I’m adding another: the city’s skyline. And where better to see it than from above? Queen Elizabeth Park is a gorgeous place to spend a quiet morning enjoying greenery and scenery. The park is filled with walking trails (some paved, some not), so it’s a good place to get some exercise while enjoying the outdoors. There’s a cute duck pond where you can rest from all that walking, too. The top of the park features a lookout point that has a stunning view of Vancouver’s skyline peeking through clusters of trees. Below the lookout is a botanical garden, with walking paths that weave around colorful flower beds. Not too far in the other direction is a fountain, where the water is alternately serenely bubbling and aggressively whooshing into the air and small groups of people can be seen practicing Tai Chi. My favorite thing about Queen Elizabeth Park, though, is the Bloedel Conservatory, a must-visit for photographers, nature lovers, families, and casual travelers alike. 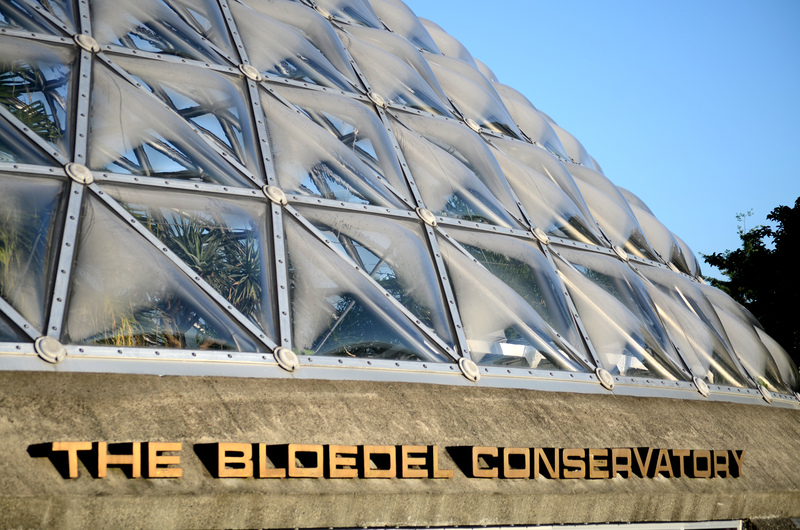 Bloedel Conservatory is home to hundreds of species of plants and birds from all over the world, so even a slow saunter feels adventuresome and exotic, as if you’re trekking through the jungle rather than in a glass-domed building in a large city. I loved seeing bright flowers and patterned leaves I’d never seen before, and I pretty much wanted to photograph everything. The fauna, of course, can be a bit difficult to shoot. I recommend chatting with the volunteer docents, though; they’re helpful, knowledgable, and passionate, and one in particular pointed out angles I hadn’t considered and explained a few traits to anticipate from the birds. Most of my shoot was an exercise in patience, though, since animals rarely do what you want them to. 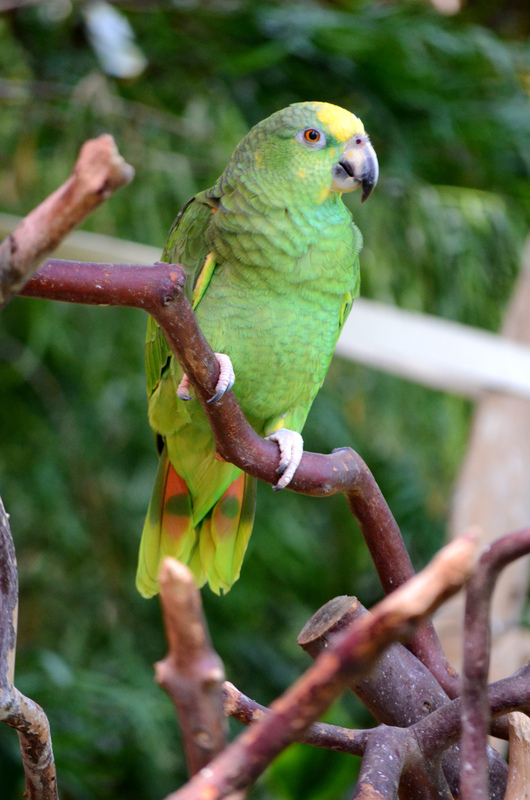 My new docent buddy noticed I was photographing Casey, a yellow-crowned Amazon parrot, and mentioned that he’s often hard to capture. Call me Birdwoman, I guess, because all of the larger birds at the Conservatory looked right at my lens or paused their movements so I could capture them. The little birds were much trickier, but I loved the challenge of trying to get a shot before they flitted away, chirping to each other. Their movements are impressively fast, and I did get some interesting motion-blur shots when 1/250th of a second was no match for their fidgets. Overall, a visit to Queen Elizabeth Park & the Bloedel Conservatory is a lovely way to spend a morning, afternoon, or evening for nature lovers, view-seekers, Tai Chi practicers, and photographers. If you go, say hi to Casey for me. For more posts about my trip to Vancouver, click here. Loved seeing your photos of all the vivid flora and fauna from the “jungle” of the Pacific Northwest! Makes me want to go visit Casey. Those are great pictures you captured of the birds. Sounds like a lovely time. Thank you Susan! They require a lot of patience. Absolutely beautiful pics, Sabina! I’d love to go to Vancouver some time. That skyline picture is fabulous! I visited Vancouver once–for an afternoon, about 30 years ago. Frankly, I don’t remember much at all. Your pictures make me want to go back. Your bird pictures are incredible!! Thank you so much!! I primarily went as a photography trip and I’m thrilled at what I shot. 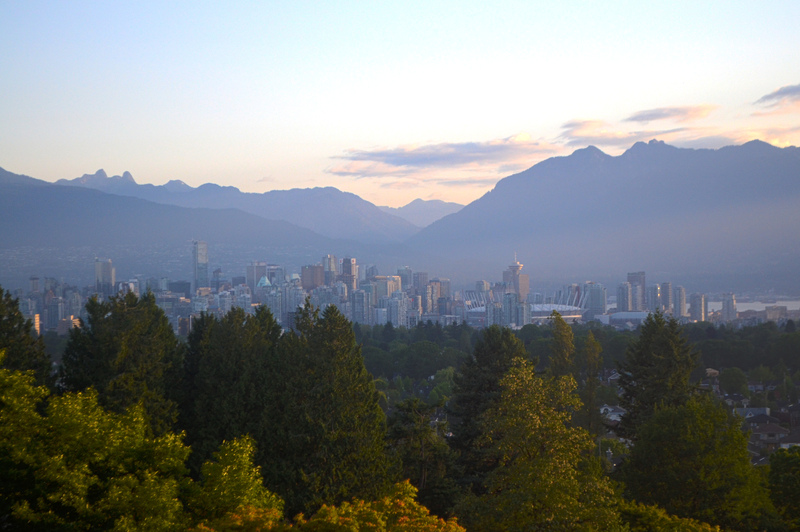 You’ve just added a few more stops on our future itinerary to Vancouver! Good! I hope you love them as much as I did! Absolutely beautiful! I may need to make a trip to Vancouver. It’s a great city for sure! I love all the vibrant color in your bird images! Isn’t this world just stunning? I’ve visited Vancouver B.C. a number of times, but never Queen Elizabeth Park. I will definitely put it on our agenda next time we go. Thank you! Thanks Renée! I was definitely marveling at all of nature’s creations. I haven’t been to Vancouver in years, but this park and people doing tai chi early in the morning is one of my most vivid and favorite memories from that trip! I’m going back next month and can’t wait!! That’s exciting Erin! I love that this is one of the things you remember most. I wonder what will stay in my memory from this trip over the next few years. I haven’t been to Vancourver since college! I really need to get back. Definitely do! It’s a great city.